Yes of course, this is your home. 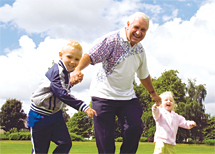 When you move into a Metlifecare village we understand it is important to maintain your family and social ties. Any family members or friends are able to stay for a combined total of 90 days per year. Longer stays require the agreement of the Village Manager. What if I want to redecorate my home – for example, change the wall or floor coverings? Your home can be redecorated to your tastes in consultation with and at the discretion of the Village Manager, at your own cost. You have the freedom to come and go as you please. We will maintain the grounds, clear your letterbox and manage security giving you peace of mind while you are away. Can I still apply for Government-funded financial help? If you have been assessed as requiring ‘rest home level care’ by a Needs Assessment and Service Coordinator (NASC) you may be eligible for a government subsidy to assist with paying for care. Subsidies for care are means tested by Work and Income on application and take into account your income and assets. Please call WINZ on 0800 559 009 for advice and assistance with your application. If you prefer, speak to us and we can help assist you with this process. What happens if I have an accident or get sick? If you have an accident and need immediate attention, all our villages (except at Kapiti Village) have strategically placed emergency call buttons in your home which you simply press and your call will be responded to. Where an illness is of a temporary nature, meals and other services may be arranged to assist – depending on the help you need (except at Kapiti Village). Our development villages, Oakridge Villas, Greenwich Gardens and Papamoa Beach Village, will be able to offer these services in the future. We aim to help you recover quickly and comfortably which can be an enormous relief to you and your family. This service is provided on a “user pays” basis. Who is responsible for the cost of council rates, water rates etc? When you live at a Metlifecare village you pay a village fee to cover costs, such as council rates, water rates, building insurance, external maintenance, the upkeep of the community facilities, gardening, salaries of the staff and village operations. This simplifies your expenses into one easy to manage fee leaving your own personal choice of phone, personal contents insurance and electricity. The Capital Sum is the price paid for the Occupation Right Agreement (ORA)* to secure your right to occupy the unit of your choice within any Metlifecare village. The Capital Sum varies according to the size and location of the unit you choose. Once all the conditions have been met, the Capital Sum is required to be paid on settlement. * An Occupation Right Agreement is a legal document that gives you the right to occupy that unit and sets out the terms of your occupation. The Management Fee is capped at 30% of the original Capital Sum of your unit, with the 30% being accrued monthly at 10% per year for the first three years of occupancy. It is payable on the termination of your ORA, by way of deduction from the original price (i.e. the Capital Sum) of your unit. When you live in a village you pay a Village Fee. This is a consolidated fee that captures costs such as council rates, water rates, building insurance, the upkeep of community facilities, gardening services, salaries and wages of the staff and village operations. By paying a Village Fee, the hassle of paying existing multiple bills is eliminated – one fee takes care of it all. What’s more, Metlifecare assures this fee will not increase, thus it is fixed for life, irrespective of any increases in costs experienced by Metlifecare. This means you will always know what you are paying now and in the future, and no longer have to worry about unpredictable cost increases. You are responsible for the cost of the internal maintenance of your unit, power, phone and contents insurance. Who ensures that residents get what they pay for? When you move into a Metlifecare village you will have peace of mind knowing an independent Statutory Supervisor has been appointed to each village. The role of the Statutory Supervisor is to monitor the financial position of the village to ensure that Metlifecare meets its obligations to you and there is a Deed of Supervision in place which governs the relationship between the Statutory Supervisor and Metlifecare. The Statutory Supervisor also holds a first ranking security over the village land. The Residents’ Committee also meets regularly with the manager and can raise any issues on behalf of residents. Yes. A summary of the village company’s audited annual financial statements is presented at the Annual General Meeting of the village. The village company’s Annual Report, including audited financial statements and the interim financial statements (unaudited), are available to residents, on request. Can I transfer to another Metlifecare village? Yes you can. We won’t charge you transfer fees if you transfer from an independent living unit to a serviced apartment. Otherwise, we’ll discuss the transfer costs involved, and agree these with you. If you do choose to leave, simply write to the Village Manager expressing your wish to terminate your Occupation Right Agreement (ORA). One month after receiving the letter, your ORA will be terminated and Metlifecare will endeavour to re-license your unit. Following the re-licensing you will be refunded the original purchase price less the accrued management fee. Who pays for the refurbishment of the unit when I leave? On termination of your ORA, Metlifecare is responsible for all refurbishment costs of your unit. You may be responsible for any damage beyond fair wear and tear and any agreed reinstatement costs. What happens if my unit doesn’t re-license straight away? Your village fees will cease as soon as Metlifecare is provided with vacant possession of your unit. If it takes longer than nine months to re-license, we will pay you interest on the outstanding capital. Plus you can apply for an early repayment of up to $20,000 of the capital sum when your unit is vacated. We are here for you and will answer any other questions you may have.